I can get your books DISCOUNTED or FREE! MESSAGE ME and ask how! 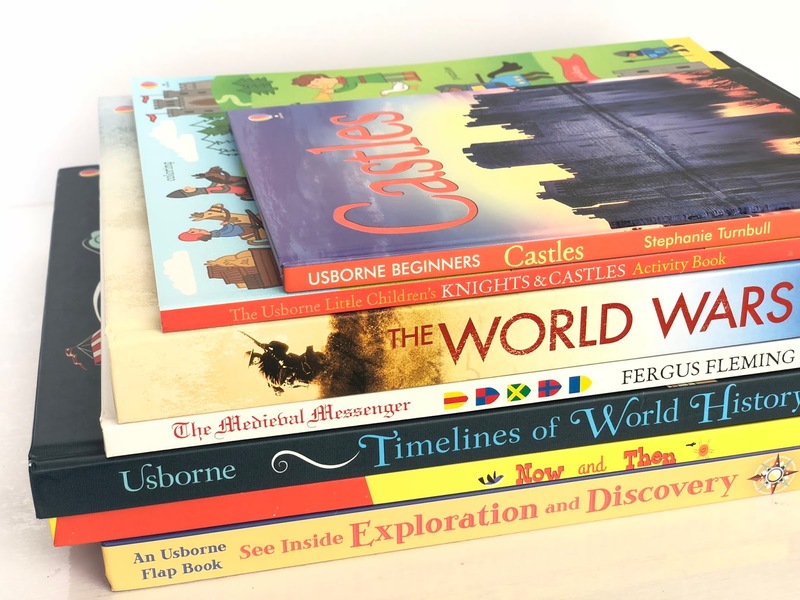 Join our Literacy Group to follow along on our CC Homeschool Journey, keep up with all things Usborne Books, and be a part of a community of people RAISING READERS! If you don't pick up ANY OTHER books for the year, or you want to keep it as simple and streamlined as possible, I recommend our ENCYCLOPEDIAS! Click here to peek inside this stack. These encyclopedias have fantastic photography, are well laid-out, full of great info without being overwhelming, and are internet-linked!! They are absolute must-haves for every home. 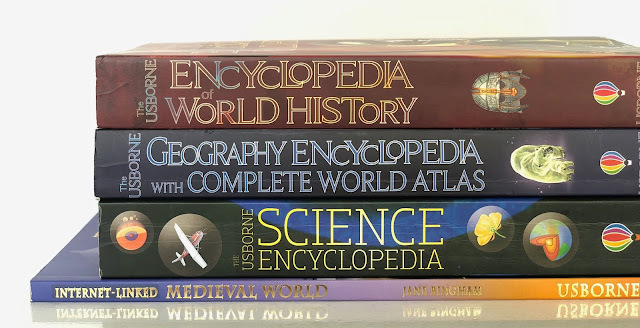 The top three encyclopedias here are sold as a set in HARDBACK, or you can buy them individually in hardback or paperback. The Medieval World Encyclopedia is included IN the World History Encyclopedia! 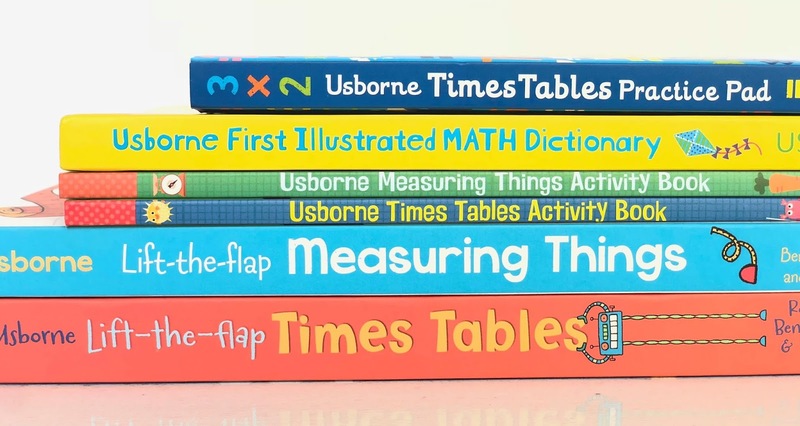 All of these math books are fantastic. In our home, we use the Lift-the-Flap REGULARLY as part of our math practice. The activity books are engaging, bright, creative, and perfectly challenging! Peek inside this entire stack here. If I had to pick just one of these, it would totally be the Lift-the-Flap (an obviously favorite in our home!) It's fun to explore, full of info, and still a great map reference! Peek inside of them here. Each of these Bible Story Books are fantastic in their own right. I love the Illustrated Bible Stories because of the fantastic, bright illustrations. I love the Book of Bible Stories because it's a dual reader. Dual readers have TWO levels of text, one for beginners and one for more advanced -- an absolutely perfect pick for shared reading! Click here to peek inside! We are particularly excited about history this year! What a fantastic line-up of studies! From this stack, I recommend definitely grabbing the Timelines of World History book. It will be a great reference for ALL THREE Cycles! I also highly recommend the World Wars book. It is sooooo well done, perfectly written for a variety of ages, and loaded with beautiful photography! Peek inside the entire stack here! If we're talking the Renaissance, we can't skip Shakespeare! 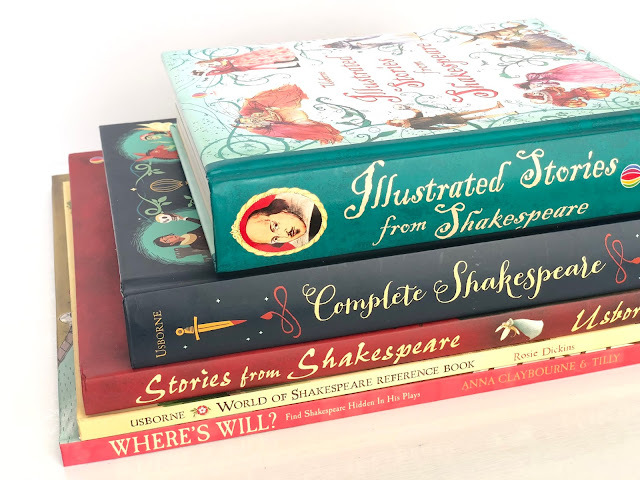 My favorite book in this stack is Complete Shakespeare! EVERY PERSON needs this book! It is an abridged version of ALL of Shakespeare's plays, written in modern English. These are great for introducing his works before moving on to complete and original versions. Peek inside here! Definitely, absolutely, without question. GRAB THE Not-Your-Everyday Illustrated Thesaurus!! Thank me later. Look inside the enter stack here! I am so surprised at how much use we've gotten out of this stack of books! They're great for all three cycles and all incredibly well done. 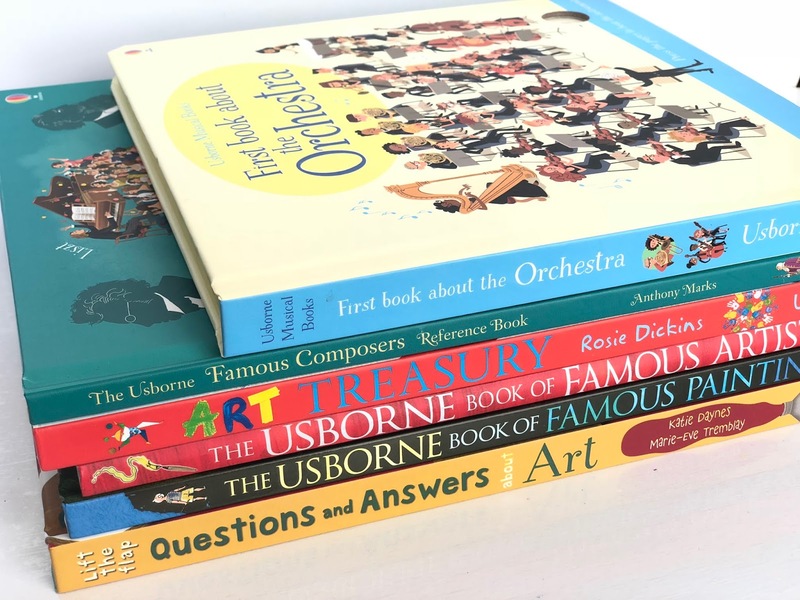 The First Book about the Orchestra was a fantastic intro for my five year old this year. We also spend a lot of time with the Lift the Flap Art book. Art Treasury is my personal favorite, because it teaches about artists and then teaches the reader to create art using the same techniques! Informative and fun! Narrowing down my favorite in this stack is near impossible. They ALL get a lot of use in our home! The pocket books are probably pulled out most often. Otters, Snails and Tadpole Tails is an EXCELLENT book of poetry that I cannot recommend highly enough!! If you're only grabbing one thing from this stack, I would pick one of the science dictionaries. 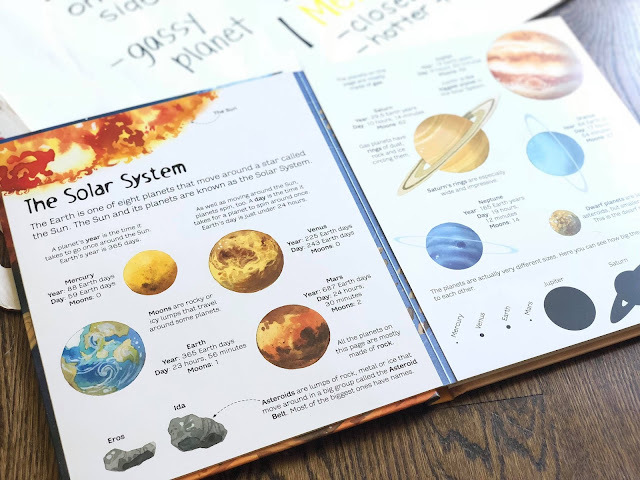 The Illustrated Elementary Science is thorough, beautiful, and written in a very accessible but informative manner. The Illustrated Dictionary of Biology is a staple for any home. 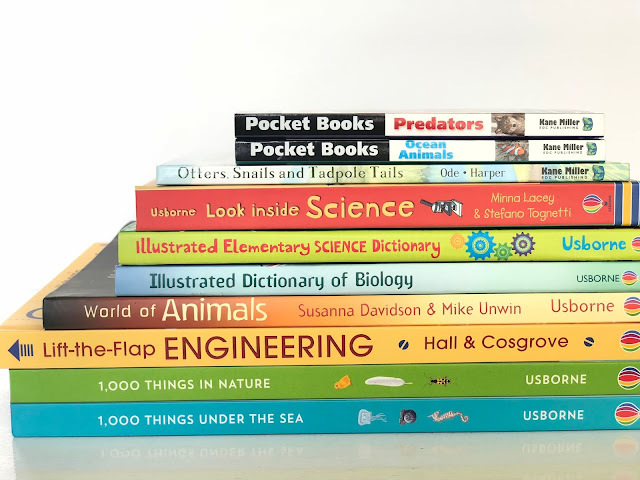 Consider grabbing the Illustrated Dictionary of Science (not shown here), which is a combined volume including Biology book as well as the Physics and Chemistry versions! Peek inside all of them here! 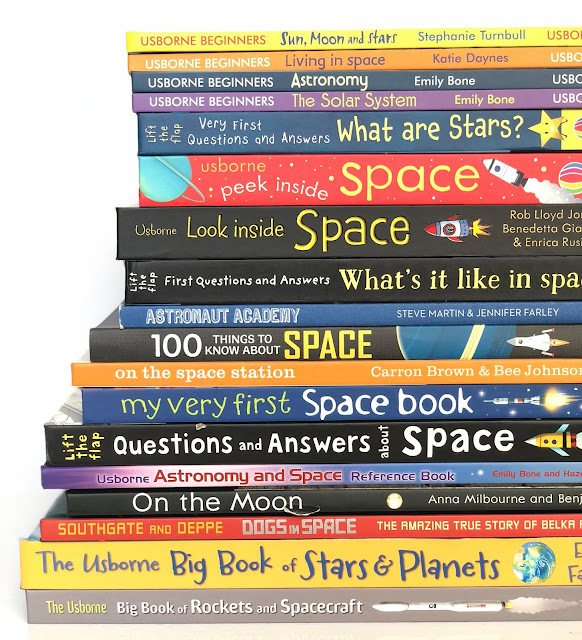 We have SO MANY great space books that they needed a category of their own for sure! Again, I could make a case for every book in this stack, but if I were forced to pick just a couple, I would say our two personal favorites are Look Inside Space and Big Book of Stars and Planets. Decide for yourself by peeking inside here! This year, we started our official Homeschool adventure. It's a place I thought (and swore) I'd never be, but here I am. Homeschooling my two kiddos. What's better is that my sister-in-law has decided to embark on the same journey. Just another incredible way these four cousins get to do life together! 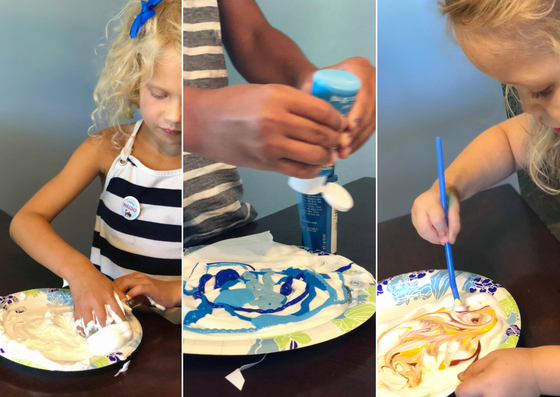 One of the benefits of raising our kids together, and being on a similar homeschool journey, is that we get to support each other in really fun ways like Cousin Camp! What is Cousin Camp, you ask? Well, it's basically an opportunity to dump our kids on the other aunt so we can have a day to ourselves. (Let's pretend I'm kidding). We started out the day gearing up in our togas. The girls weren't interested at first, but the boys were... liberated (need I say more?). Ha! 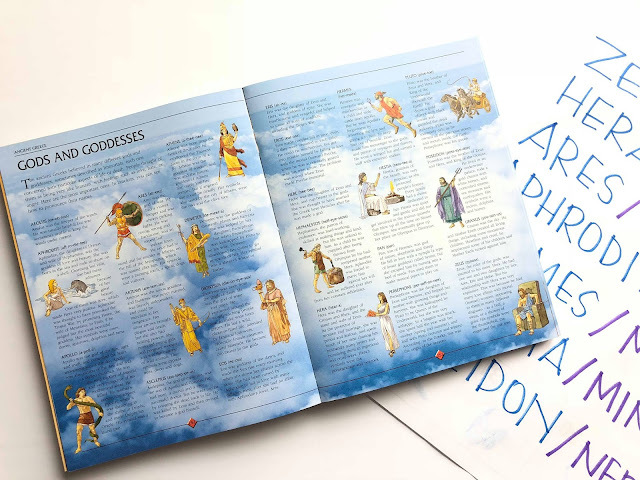 We sat around for a bit, flipping through our Ancient History Encyclopedia and soaking in the awesome photography & illustrations. We talked about what looked familiar or interesting, and then discussed the role and importance of the gods in ancient cultures. 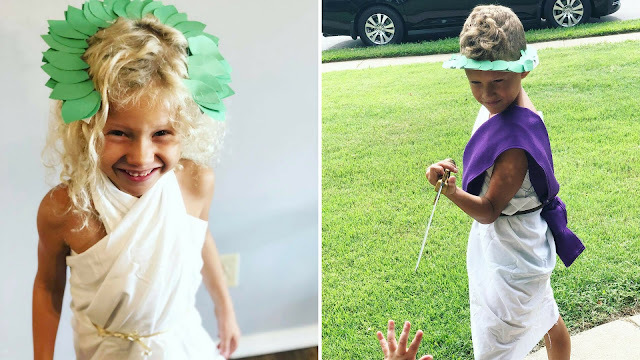 We charted the Greek & Roman gods that we are memorizing in CC, discussed each of their divine realms, and then made up motions to represent them while we sang our memory song! I originally had no intention of including a craft in our day, but I saw this brilliant & simple idea on Pinterest and couldn't pass it up. 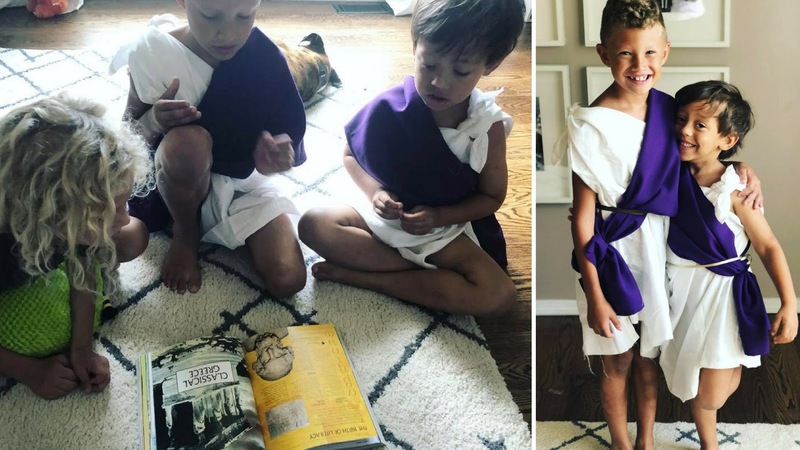 It was an excellent way to learn a little bit about ancient Greek & Roman cultures, and an even better way to keep their hands busy while I read aloud to them! 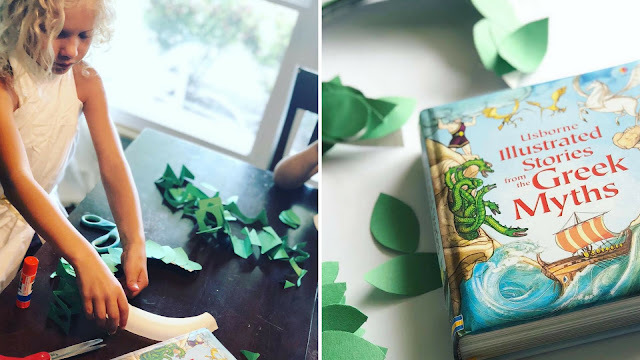 The kids love this craft! All four sat for a good 30 minutes working diligently on their wreath crowns. While they worked, I read aloud The Odyssey (obviously an awesome abridged version for kids). I was impressed at how well this story was retold to be appropriate (and engaging) for young children. See inside that book here. During lunch, I continued our read aloud. Then we followed up lunch with Disney's Hercules (thank you, Netflix). I'm pretty sure this was a first for all of them, and they loved it! Beckett was so entertained and kept coming upstairs to fill me in on what was going on. 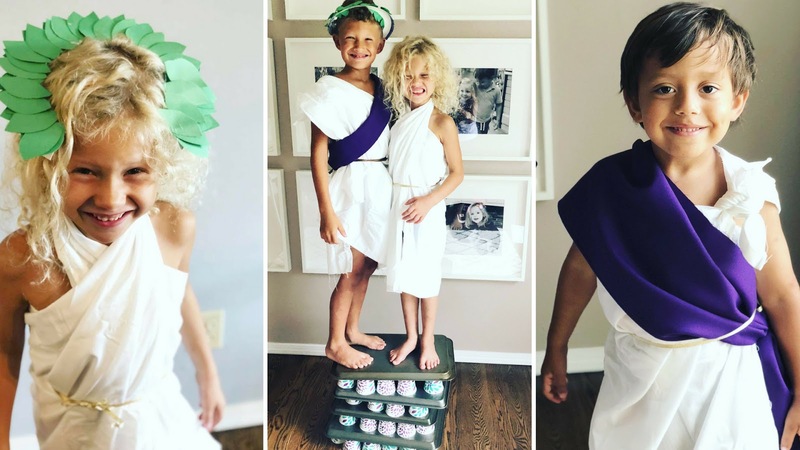 Hercules for the win! After the movie, we busted our encyclopedia back out and flipped open to the page about architecture. We used the images to evaluate what we noticed about the architecture and discussed the impact the Greeks had on architecture. We followed it up with another awesome Pinterest find! First, I let the kids stand on paper cups to see how easy they crumpled beneath them. Then we build towers based on the Greeks' strategy. 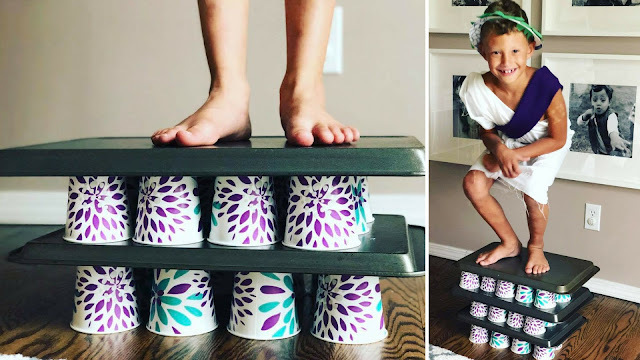 The kids predicted that our structures would not hold, and were initially intimidated to even stand on them, but they were VERY pleasantly surprised to find those paper cups could hold quite a bit when used correctly! They spent quite a bit of time, and ALL of the cups, seeing how high they could stack their structures, and were THRILLED to learn that even TWO of them could stand together! It was a great end to a fantastic day! Who Were the First Native Americans? My Very First Question & Answer Lift-The-Flap: How Do Flowers Grow? My Very First Question & Answer Lift-The-Flap: Why Do We Need Bees? My Very First Question & Answer Lift-The-Flap: What Makes it Rain? 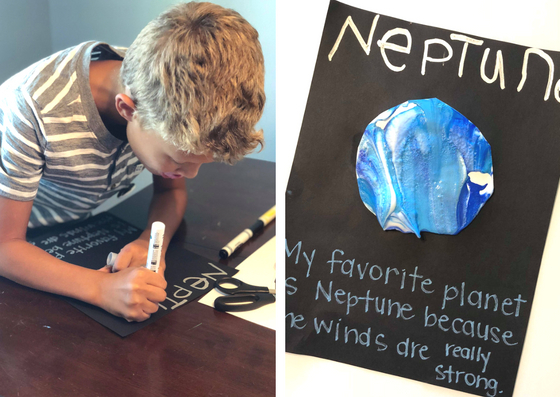 We're about 7 months into our space unit (ok, exaggeration -- but it's been slow going) and so as summer craziness gives us a reprieve, we're working extra hard to make time for some fun learning activities! Today, while the cousins were over, we broke out our Big Book of Stars and Planets with the goal of learning a few fun facts and determining what we each liked about the planets! We started out by creating an awesome chart for recording our informational text. 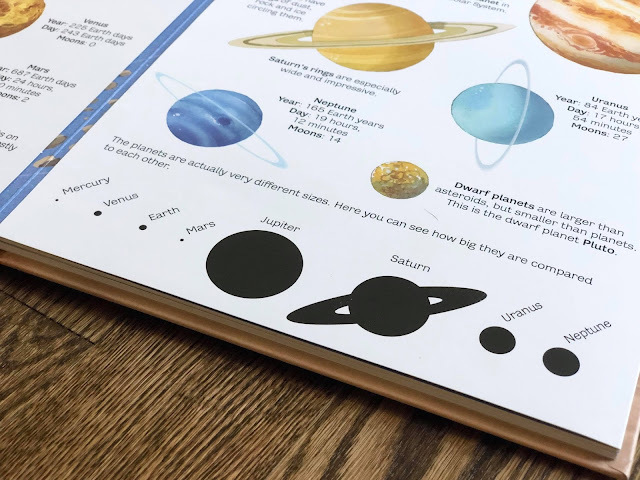 We used this cool page of the book to guide us on how big to draw our planets, and then found pictures to inspire the color choices. 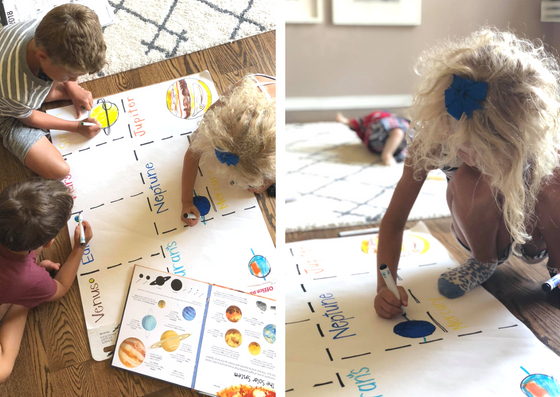 The kids identified planets in the book and colored them accordingly. 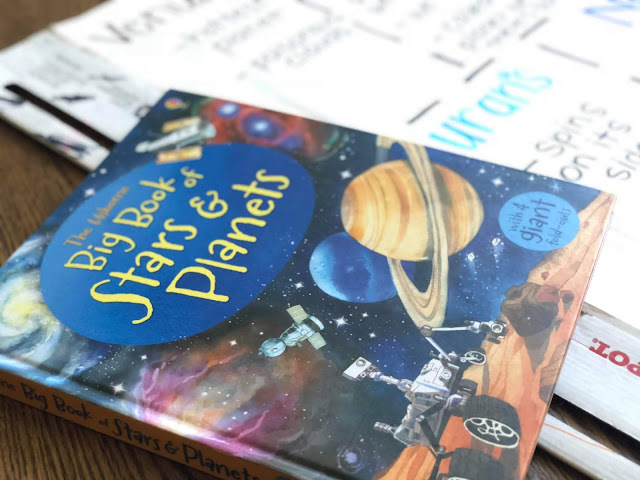 Once we were done, I read a blurb about each planet and had the kids listen carefully for new information. They knew when it would be their turn to share so they could listen extra carefully. 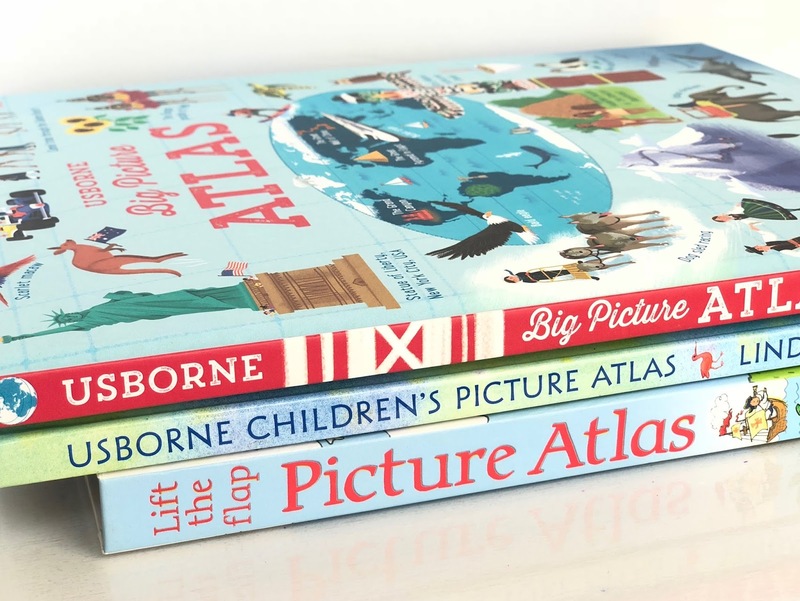 Usborne Books & More is known for designing non-fiction texts with the information broken down into bite-sized chunks. That design worked out perfectly for this activity! Their little brains would not be able to comprehend more information at once. Instead, I was able to read these 1-2 sentence paragraphs, and then they were able to tell me a fact they learned about the planet! 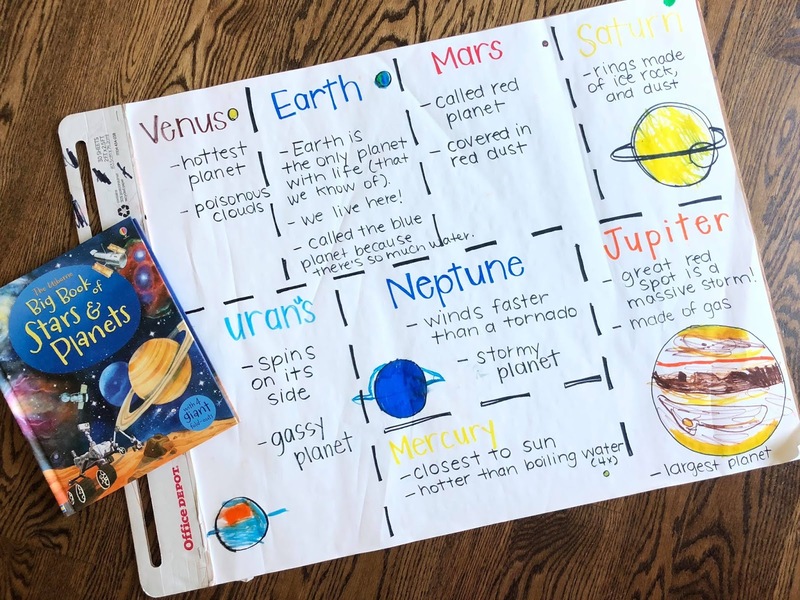 We recorded the facts on our super-cool planet chart. Then, once all of the planets had their moment in the spotlight, I re-read the list of fun facts we'd found. Each child knew they were listening for the facts they found most interesting so that they could identify their personal favorite planet! Once we made our choices, it was time for some messy fun! I found this shaving cream idea over at Crafty Morning and adapted it to fit our needs! 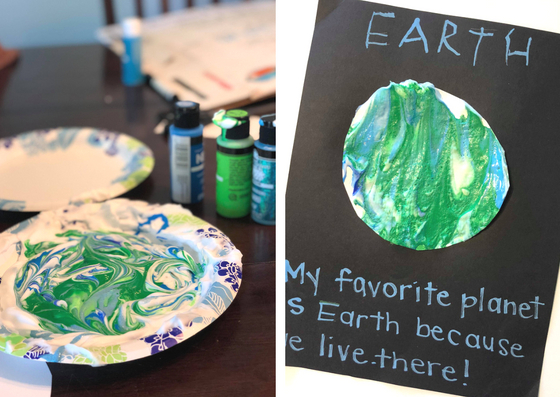 The kids used the book and our chart to determine which colors of paint they would need for their planet, then mixed it into some shaving cream, and dipped card stock circles they'd cut out. They thought this was incredibly cool, and I totally agree. 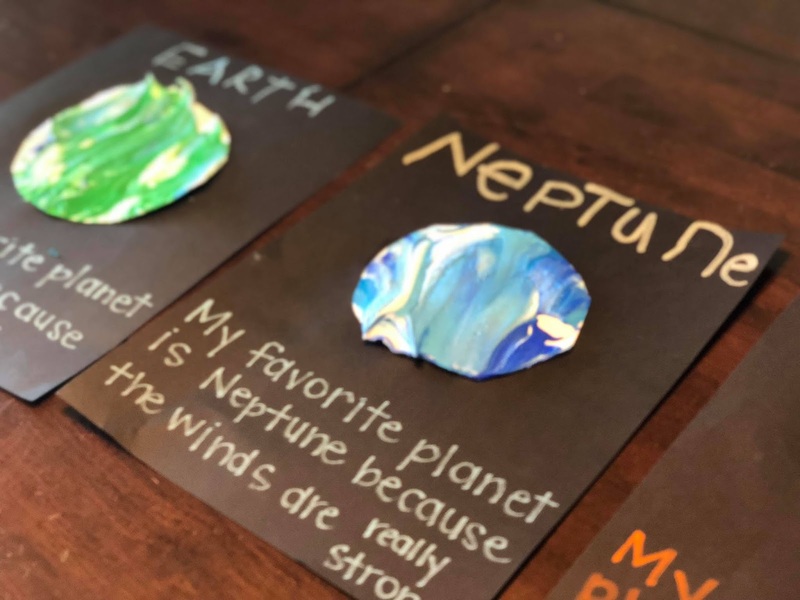 While the planets were drying, they labeled their pages with the planet name & then dictated sentences to me about why they chose that planet as their favorite. We used chalk makers to write on black construction paper, which was also a BIG hit with these craft junkies. This whole project took an hour and a half, kept their attention impressively well, and gave us practice in so many great areas! Simple science lesson for the win! I love sharing our projects and lessons over in my Facebook Group! Make sure you hop in to follow the fun! 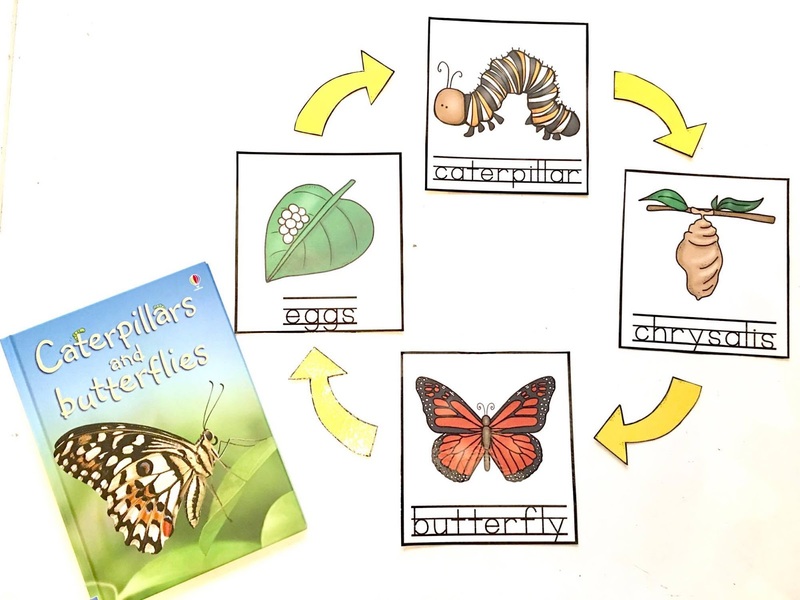 Our Perfect Preschool Intro to the Butterfly Life Cycle! This morning, Beckett learned the simple version of the Butterfly Life Cycle! I was so impressed with how easy and engaging the activity was, I had to share. 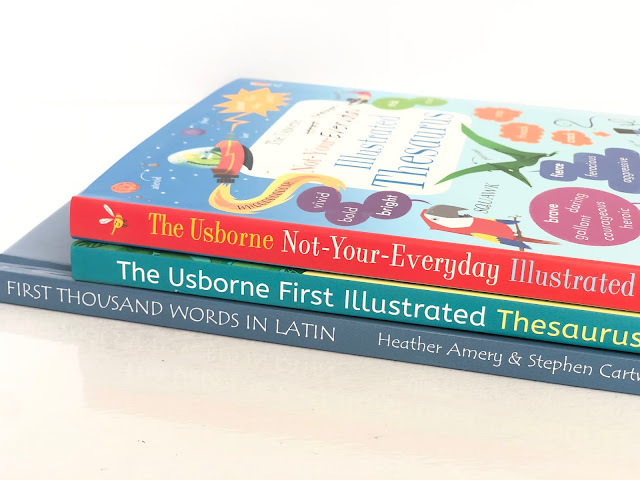 I started by just going LIVE in my [not so] super secret Usborne literacy group, but we all know those aren't pinnable. 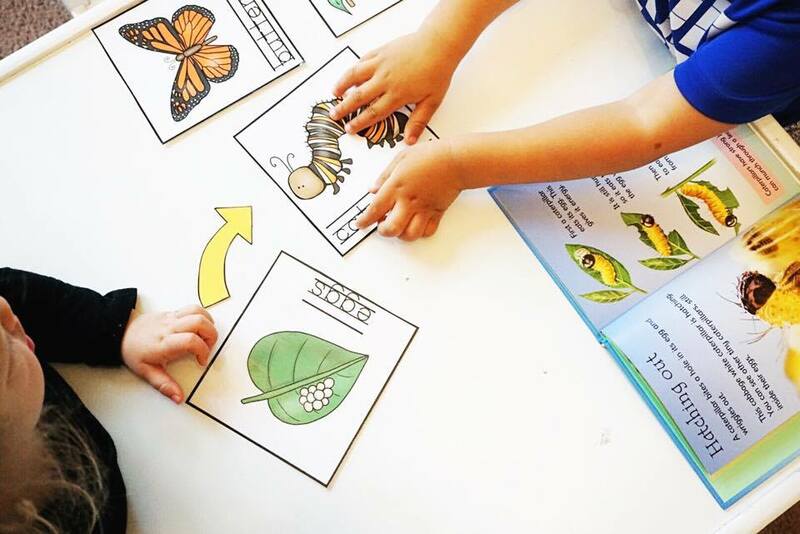 So if you're looking for a simple, yet effective process to introduce your preschool through elementary aged kiddo to butterfly life cycles, you've come to the right place! Step 1: Choose a book you love. 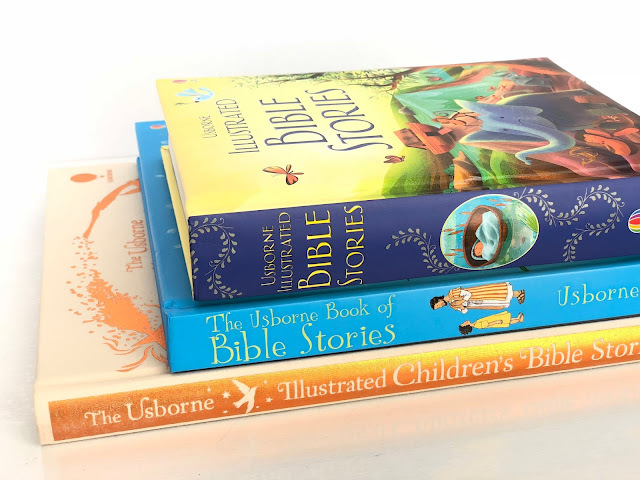 I chose Usborne's Butterflies & Caterpillars. In the spirit of full disclosure, I'm an Usborne rep, addict, and hoarder. I love this series of beginner books because they have a great combo of photography, realistic illustrations, and cartoon-like characters. The text is super simple, yet full of great facts and vocabulary. PERFECTION. Step 2: Pre-read your book. Because our book is aimed for 5+, it would be a lot of information for Beckett (3) to sit down and take in in one sitting. So instead I pre-read the book, and noted the pages that pertained to the life-cycle. [This is one of those ultra secret teacher strategies we use in school]. The book prepared me with sincerely interesting facts, phrased in a way that my little man could understand! Step 3: Introduce your Flash Cards. So the AMAZING Karen, over at Little Smarticle Particles volunteered to be a guest blogger here just a few weeks ago! 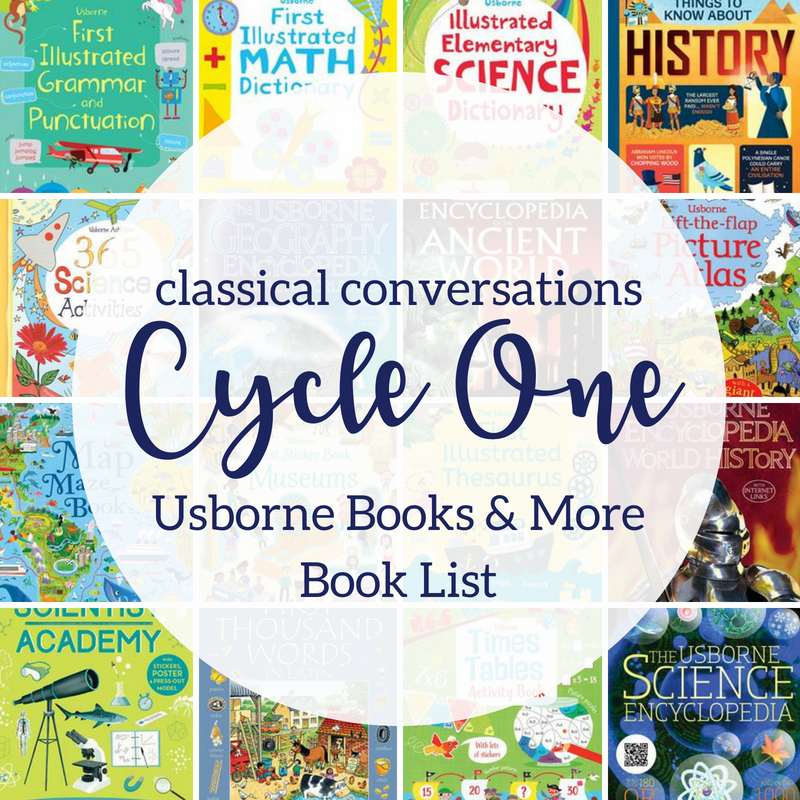 She loaded us with some fabulous ideas for teaching life cycles to littles, AND left a super awesome FREEBIE too! You can grab these beautiful flashcards, along with some other helpful tips, right here! Once you've got your cards, talk about them briefly with the kiddos and lay them out on the table. Step 4: "Read" your book together. While our book is too high to just read straight through, it provides GREAT opportunities for conversation by providing such dynamic photos and illustrations. Beckett and I went though our book together, reading only a couple of the sentences, but using the illustrations to talk about each step of the cycle. This is also where I add a LOT of "oohs" and "aaahs" and "isn't that neat?" and "what do you think happens next?" He ATE. IT. UP. Step 5: Assemble your cards in their cycle AS YOU READ. After each page, we looked for the life cycle card that represented our page and assembled it into the circle cycle diagram! And voila! 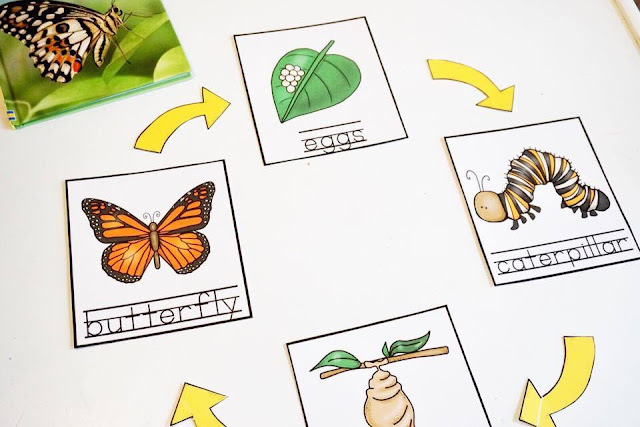 In addition to learning about life cycles, this activity is great because the simple steps of talking about the text, then finding a card to represent it, engages your child and allows them the opportunity to show comprehension. Try to let them use the cards to re-tell the cycle. This is a great skill to practice! By the end of the morning, Beckett was assembling the cards on his own & talking to himself about the cycle. I can't get over how much he adores this sort of thing! What do you think? 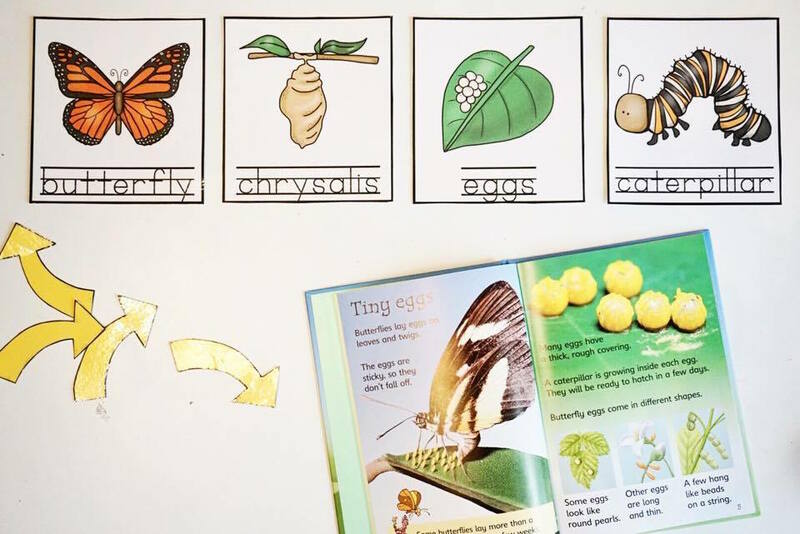 Can you totally see your littles getting into the Butterfly Life Cycle? Let me know how it goes! We're sharing this and other fabulous ideas over in our [not so] super secret literacy group. We'd love to hear from you! Join our BOOK conversation here! I'm Denise! 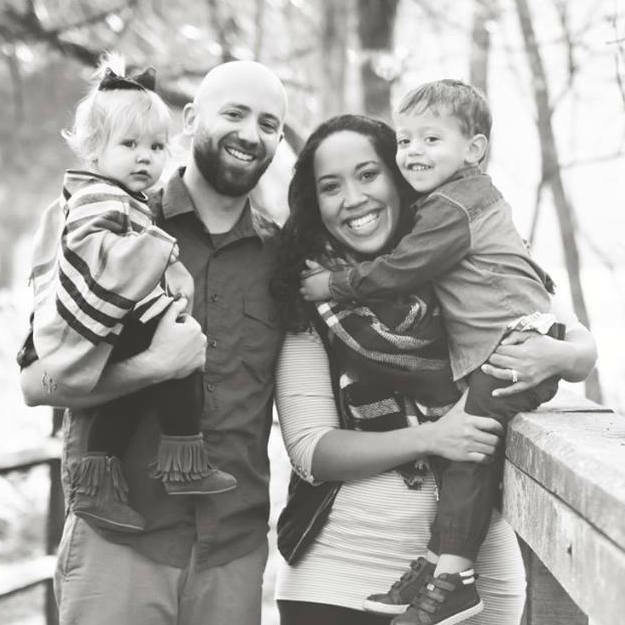 I'm a former teacher turned SAHM! 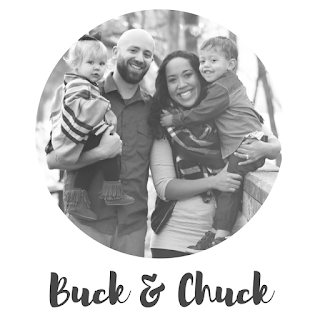 I spend my days adventuring with two of my favorite people, Buck & Chuck! 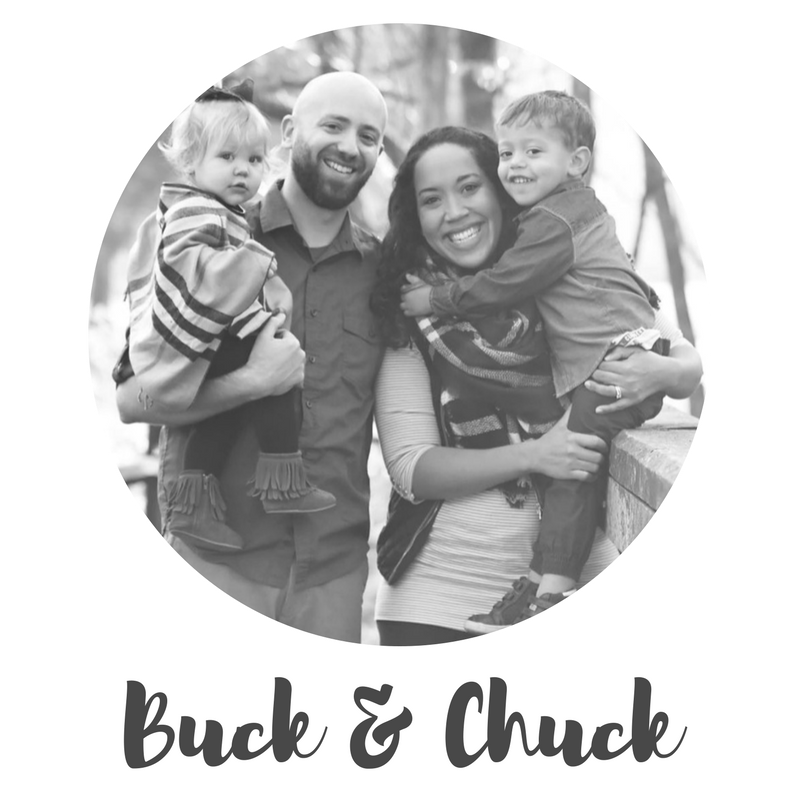 This little space is where I share my adventures in shaping tiny minds, raising Kingdom kids, and attempting to find balance in this crazy journey we call MomLife! Our BaByQue for Charlie Grace! Black History Month Bulletin Board Giveaway!